NOW that the Nigerian Communications Commission (NCC) has wielded the big stick by disconnecting millions of unregistered GSM SIM Cards after a couple of previous botched attempts, let us critically examine this policy and serious concerns that have been glided over by the ombudsman. At the risk of over-egging the pudding, I dare say that one of our greatest undoing in this part of the world is our proclivity for not stimulating debates or accommodating dissenting opinions and well-intentioned criticisms on national issues. Just recently we were told that Nigeria’s military authorities banned the use of satellite phones in the hotbeds of terrorism and insurgency in northern Nigeria. Granted that satellite calls do not traverse the normal GSM channels but they can be tracked too. Instead of banning the use of such phones, we expect our military authorities to acquire the technological competence to track the origin and end-point of such calls. Perhaps Nigeria’s military/Security establishment should have a word with Edward Snowden, the runaway American Intelligence contractor and extract from him how the American government eavesdrops and surreptitiously monitors phone and internet communications. Calls to my folks in some northern parts of the country where a state of emergency was declared cannot get through because it appears GSM operation has been shut down in those areas. So you deny millions of innocent citizens the opportunity to communicate just because you want to stop a handful of Boko Haram members from disseminating or exchanging information. By this disingenuous move, you have overtly and/or inadvertently told the bad guys that their activities can be monitored through their phone activities. Will the disruption of phone calls in these areas last forever? The answer is No! The bad guys will simply hibernate, revert to the medieval modes of communication (human-to-human) or better still launch their nefarious activities in some other less hostile areas. Sometimes one wonders whose interest our so-called leaders are serving. Given our penchant for doing things by fiat and the reactionary mindset of our so-called gaffers, it will be unsurprising if we wake up someday and hear that Nigerians have been banned from driving cars because there was a road mishap which claimed lives. Most advanced countries are rather proactive and when incidents, one-offs, occur as they are bound to, they dig into the remote and immediate causes and plug the loophole. By acts of commission or omission, buck-passing and bootlicking have been exalted to a creed with many followers in Nigeria. Somebody robs with a motor bike in Nigeria; the solution is to ban the use of motor bikes. Somebody on a vehicle with a tinted glass commits an offence; the solution is to ban the use of vehicles with tinted glasses without necessarily looking at the raison d’être of such incidents. It was in the news recently that importation of generators to Nigeria would soon be banned. Nigeria is becoming synonymous with the word ‘ban’. Ban this, ban that, no viable solution or alternative. The last time I checked, textiles/used cloths are contraband in Nigeria yet our markets are awash with these products. The foregoing are classic examples of a tyranny of the few; a few gaffers ramming down their hogwash ideas into the throats of hapless Nigerians. A while ago, there was so much frenzy and pageantry over SIM card registration. One recalls with nostalgia long queues of people shoving one another and angling to register their SIM even under the scorching sun. It was akin to an emergency. Enter NCC’s Reuben Muoka, who says ‘‘the SIM registration exercise is an avenue to reduce crime rate in our society and also give subscribers proper identification.’’ As I write, kidnappers are still having a field day with impunity and getting their ransom money. We want the NCC to go beyond declarations and extenuate the genuine concerns and potential shortcomings of SIM card registration that will be highlighted in this piece of writing. Proponents of this ill-fated exercise bandied and juggled figures to justify their take that SIM card registration is the panacea to the unprecedented insecurity and terrorism challenges bedeviling Nigeria. This white elephant project reportedly gulped N6 billion. The National Assembly cried foul, threatened fire and brimstone, promising to investigate the SIM card registration exercise. Several months later, Nigerians are yet to hear the outcome of their investigation. From the ambit of a security analyst, my take is that the SIM card registration may just be a time bomb waiting to happen if not well reined in. To be fair, there is an iota of benefit accruable from such an exercise but the haphazard deployment of the exercise seems to have made a mess of it all. It appears we are putting the cart before the horse. For a start, there is need for a well-defined Data Protection Act/Law which will stipulate how personal information of citizens should be stored and protected and also penalties meted out should citizens information be compromised. One is oblivious of such an Act/Law in Nigeria as is obtainable in most advanced countries. So far, the right to privacy stems from section 37 of the 1999 Constitution which stipulates that ‘‘the privacy of citizens, their homes, correspondence, telephone conversations and telegraphic communications are guaranteed.’’ If this section of the Nigerian Constitution is anything to go by, it behooves the NCC and telecom operators to adhere strictly to the dictates of the spirit and letters of this section of the Constitution. On a related note, Aso Rock may have an uphill task convincing Nigerians and the National Assembly on the need for an internet monitoring contract supposedly awarded by the present administration to Elbit Systems. Sequel to the ban on unregistered SIM cards, here are some salient questions in need of answers: What type of encryption will be used to protect the private information of citizens? Who manages this database? Is it the telecom operators or the NCC? Are there penalties for unscrupulous defaulters? Should the database be accessed for any reason whatsoever, is there a sort of ‘chain-of-custody’ as to who accessed it, why it was accessed and on whose request? Do we have the capability to monitor (track the precise coordinates) of calls in Nigeria in Real Time? It appears what obtains right now is a situation where somebody ends a call before his/her geographical location can be extrapolated using the nearest phone mast. If this is the case, the caller must have left the scene. If one’s phone is stolen or lost and some other person uses it to perpetrate a crime before the owner blocks it or reports it as stolen, how will you ascertain the owner is innocent? Many of the pictures or photographs captured by the Data Capture Consultants cannot pass the rudimentary requirement for facial recognition. Devoid of a verifiable comprehensive database of Nigerians, which other database will be used to reconcile or interrogate that of the NCC? In view of widespread instances of multiple SIM card registrations and sales of pre-registered SIM cards by some unscrupulous individuals and vendors coupled with rampart cases of subscribers giving unverifiable information at the point of registration, the SIM card registration exercise is anything but a success. Again involvement of private companies as Data Capture Consultants hampered the SIM registration exercise with its resultant dire security and privacy implications. In this age of wiki leaks, whistle blowing, paparazzi, phone bugging, internet surveillance monitoring, cyber warfare and hacking; can we confidently say that our private information are in safe hands? Need we say that terrorists, criminals, foreign state actors etc can hack into or bribe their way into such a database if it is not well encrypted or secured? Recall that the United States and China are currently enmeshed in an unending finger-pointing over cyber attacks. Don’t forget in a jiffy that sometime last year, the personal information (house address, bank account numbers etc) of serving and retired Personnels of Nigeria’s State Security Service (SSS) went viral online. Now imagine the far-reaching implications of concentrating all the personal information of Nigeria’s plus or minus 100 million mobile phone subscribers in one place. From the foregoing, it follows that centralising the personal information-names, addresses, fingerprints, passport photographs, dates of births etc of all GSM users in a central database devoid of international best practices and protection is, to say the least, a national disaster waiting to happen. I cringed when I stumbled on a Nigerian company offering for sale, a database of the plus or minus 100 million GSM subscribers in Nigeria. Permit me to underscore a case I had to investigate and sort out a while ago in my line of professional calling to emphasize my qualms with this SIM card registration fixation. My client remitted money into somebody’s bank account for a transaction and the bloke absconded. My client did not know where the geezer lives or how to get hold of him but he had the bank teller he used for the remittance. After brainstorming on viable solutions, I waltz into one of the bank branches that the runaway geezer had an account with. After deploying some ‘Social Engineering’ expertise, pronto I got the guys house address. When we finally tracked him, he thought we were ghosts. The above scenario enunciates the far-reaching implication of somebody volunteering his personal information unmindful of how it can be used or accessed. The same applies to hapless Nigerians giving out their personal information under the guise of a SIM card registration that is deficient of proper checks and balances. For the record, an individual’s fingerprint is strictly PERSONAL and unique to that person. No two human beings on earth have exactly the same fingerprint. Two people can share the same blood group, genotype etc but no two human beings (identical twins inclusive) have the same fingerprint. This explains why a fingerprint is crucial in forensically linking a culprit or suspect to a crime scene. Hence, if you want me to volunteer my fingerprint for any reason, there must be a law, guideline, guaranty if you like, that spells out how my fingerprint should be kept, stored or protected so it does not fall into wrong hands. According to International best practices, the only people that have waived the right to the privacy of their fingerprints are convicted felons. The last time I checked, the United States of America and the rest of Europe did not have to waste equivalents of N6 billion on a white elephant project in the name of SIM card registration. If it were to be such a viable project, will these countries not have done it before us? 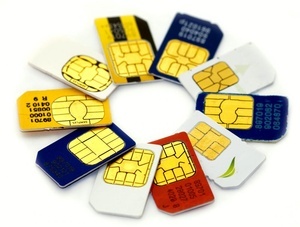 Till date GSM subscribers still buy pay-as-you-go SIM cards across North America and Europe. Still reasoning from the compass of common sense, a smart criminal, say a kidnapper in Nigeria hell bent on perpetrating a crime can still easily obtain an unregistered SIM card from any neighbouring or distant foreign country, roam it and use in Nigeria. So what is this entire hullabaloo? If the above scenario is far-fetched, what happens if say a kidnapper goes to one of the nearest ubiquitous commercial phone operators, pays N20, places his call, makes his request for a ransom and waltz back to his den. Whom do you apprehend, the hapless and innocent phone operator? The registration of SIM cards may be well-intentioned. Our gripe is that it is poorly managed and the timing is wrong. The concept is not a stand-alone panacea to the hydra-headed insecurity and terrorism miasma currently bedeviling Nigerians as we are meant to believe. As a matter of fact, if not well harnessed, such an exercise may just be a national disaster in the offing. Again, if we must toe such a path, we must stick to international best practices. We must not put the cart before the horse. Devoid of an authentic Identity Card, if a SIM card subscriber registers his details as say, ‘Sani Abacha’, how will you ascertain he is not who he claims he is? It would suffice Nigeria first of all sorts out a comprehensive database of Nigerians. Perhaps the current National Identification Number (NIN) project should be given some bite and must not go the way of the previous exercise under the auspices of Afolabi, the then Minister of Internal Affairs. In addition to having comprehensive national crime databases accessible in real time by respective police forces in the nook and cranny of their homeland, the United States has a Social Security Number; the United Kingdom has a National Insurance Number. Most adults of working age in these countries have these numbers. When this number is fed into a database, it spews information about that person. The National Assembly must rise up to the occasion by articulating or fine-tuning (if one already exists) a comprehensive Data Protection Act/Law to save Nigerians and indeed themselves from the impending catastrophic miasma of the hyped SIM card registration exercise. It is also incumbent on the human right community and the Nigerian media (Print and Electronic) to take this battle up. Since the various GSM operators bankrolled the SIM card registration of their respective networks, may we humbly implore the NCC to account how they expended the N6 billion earmarked for the SIM registration exercise? Let us do away with our gung-ho knee-jerk swagger to issues of strategic national interest and come up with thoughtful lasting solutions. I am a die-hard adherent of superior argument/reason; I beseech the NCC and proponents of this SIM registration phenomenon to assuage the cogent concerns of some discerning and patriotic Nigerians who have the temerity to fend against bandwagon effect. •Okereke is a Security Analyst & Consultant in Abuja.